Stephanie Hayden, Co-founder of SmartOakland, and CEO of Vision Architecture & Metropolitan Intelligence, lives in Oakland, and has joined a few City of Oakland projects, as a pro-bono contributor, using creative storytelling and visualization to describe future city scenarios for Oakland. The first project was, "SmartOakland", which started as a crowd-sourced response to a Federal Department of Transportation call for Smart City proposals and the next was for the Rockefeller Foundation's 100 Resilient Cities Centennial Challenge. Since these two project she began co-hosting Smart City Meetups with Michael Ford, City of Oakland, Department of Transportation to surface community conversations and project concepts for Smart City initiatives in the city of Oakland which has turned into our SmartOakland non-profit, today. Here are some snapshots from the Resilient Oakland project including the coloring book Stephanie created to tell the story of past, present and future Oaklanders' resilience and concepts of how people can work together to regenerate and grow resilience in their own micro-communities and stay rooted in Oakland. The Rockefeller Foundation's 100 Resilient Cities Challenge got global city leaders' attention by asking if their city was prepared for the next big shock and if their constituents were really in a solid position in their lives to handle daily challenges where resilience is key to their quality of life. The City of Oakland was accepted in Rockefeller Foundation's 100 Resilient Cities Wave 1 initiative and began working on plans for creating a resilient city playbook to describe how members from throughout the community would contribute to creating a collaborative, data-driven, equitable future together and Vision Architecture joined the project to tell the story of Oaklanders' past, present, and future of regeneration, roots, and growth in our communities. Combining science, technology, engineering, arts and math with creative storytelling we will launch the Resilient Oakland coloring book and future city design challenges to empower Oakland youth to learn about community and physical resiliency. The purpose is for youth the discover what htey can do to become the architects of their own futures. 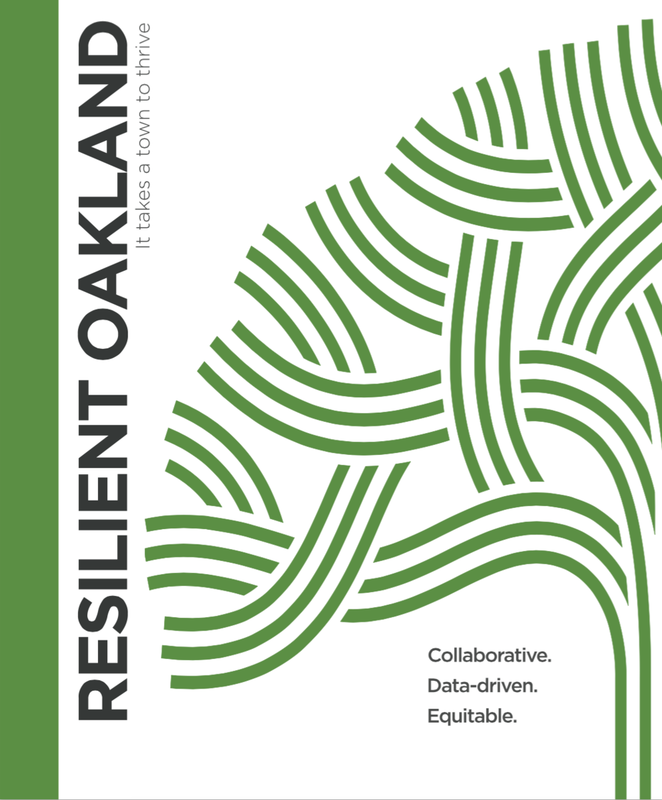 The Resilient Oakland coloring book aims to grow connections and resiliency planning between and among residents of all ages, languages, cultures, and perspectives. Each chapter is comprised of snapshots in time from Oakland's past, present, and future so people an connect on local history, envision present projects, and understand that what we imagine can become a vibrant, sustainable reality when we work together to create connected communities.